Liz's finely crafted treasures are back, better than ever! This deep crimson Shiraz started out as intensely flavoured grapes on low yielding Southern Fleurieu vines, harvested in the cool of the night. Intense aromas of wild berry, chocolate and baked spice and a hint of toasty vanillin oak all followed up by strong ripe plum and berry flavours with a sensationally long velvety tannin finish. Sooo much flavour in one bottle! Past vintages of this cracking Shiraz have all been quick to sell out, with rave reviews and a massive 92% buy-again rating from Angels. Getting your hands on this boutique SA Shiraz for under $15 is an Angel-only privilege...go on and enjoy! Liz’s Signature Cabernet Sauvignon returns again after its 94% buy it again rating from Angel’s. Impenetrably deep ruby in colour with intense cassis aromas and a touch of white pepper. You’ll be lovin’ this full bodied Cabernet with yummy toasty flavours and hints of black cherry and green olive, all wrapped up with a savoury spicy finish that goes on and on!. An excellent single varietal wine from a premium Australian wine region loaded with complexity at a bargain price of under $15 for Angels! Prepare your tastebuds - Liz's sell-out Merlot is back! With an irresistible nose of black berries, blackcurrents and touch of fresh mint, you'll be hard pressed not to dive in to your glass. The aromas continue on the carefully structured mid-palate, with a lingering finish that will make your food match sing even more. The Merlot was fermented with a typical Bordeaux style yeast strain to show off the full potential this gorgeous grape varietal. The malolactic ferment was managed with gentle pumpovers to maximize colour extraction while maintaining the juicy soft tannins and classic warming Merlot characters we all love so much. Ageing a wine of this quality in French oak has ensured another winning Merlot from Liz, which will no doubt put on a repeat performance after the last vintage flew out the door. It returned Angel praises to the tune of a huge 92% buy-again rating! Don't dilly-dally, pop this boutique-run winter treat in your basket today. 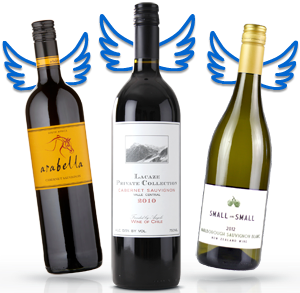 Back in the hands of Angels, Jen's 2017 vintage Hero Cabernet Merlot is posied to steal the show once again! Your glass will take on a lovely dark red colour, and display incredible red berry, dry herbs and violet perfumes. The palate is generous and juicy, with vibrant berry and cherry fruit, a lusciously supple mouth feel and a long tasty finish. In Jen's words: "As my Naked journey has continued, my growers have gained the confidence in the market to put all the inputs into the vineyard, which results in happy vines and delicious grapes. This subsequently means better wines and better value for Angels. But then again, that is the Naked way, isn't it!" Each of the three Heathcote, Rutherglen and King Valley parcels were ripened at different stages and picked at varying intervals to be made into wine separately by Jen, before being blended to perfection. The Hero range are the next step up from the Rebel range, giving you the max quality for minimal dosh - enjoy! Leighton strictly limits the yield of his family vineyard each vintage to maximise every opportunity of healthy fruit growth, with the ultimate goal of the most downright delicious Shiraz you've ever licked your lips for. As he executes his masterful winemaking plans, Mother Nature ticks away in the stunning high hills of the cool climate Victorian Pyrenees. Get ready for a bouquet of black pepper, bramble and charred French oak. As this liquid joy hits your palate, you'll revel in bold layers of black cherry, liquorice and cacao and balanced oak, closing with a classic tannin structure. Angels, this seriously tempting creative grape juice was crafted exclusively for you! 100% Pyrenees Shiraz under $16, made for you in the vineyard that Leighton helped plant back in 1999. Direct from a passionate industry pro into the hands of passionate wine fans, stories of winemaker liberation don't get much more authentic than this! Andrew's dreamy Hunter Chardonnay is back! A delicious dry white, it has enticing melon and white peach aromas and a bright core of fruit complimented by high quality vanillin oak. The climate combined with some inventive winemaking has maximised both palate and aromatic layers for your enjoyment - yum! Each mouthful is refreshing with a long finish that makes this an exciting wine to match with food. 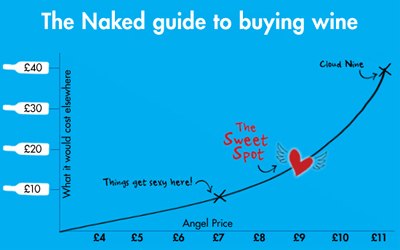 Angels are ensured serious bang for buck, and its also fantastic on its own to get the party started. Simon ‘Sorby’ Adam’s Shiraz showcases why the Barossa is world famous for this variety. This flavour-filled shiraz is overflowing with luxurious aromas of blackberry, mocha, thyme and cedar characters. Oh-so-sumptuous and velvety and offers up brilliant fruit-driven power and intensity all wonderfully framed by firm tannins..
A sensational Angel price, super value, and a legendary winemaker with 40 years experience in the Barossa. This won’t be on the shelves for long! Simon ‘Sorby’ Adam’s Cabernet Sauvignon combines a solid core from the Barossa Valley backed up by the best of Eden Valley’s aromatics. A delectable Cabernet shows beautifully lifted aromas of dark fruit, smoked game, dried cherry, mint chocolate and toasty nut aromas! All leading to a generous palate that is succulent and rounded. And then, gorgeous fruit flavours and silky mouthfeel, stylishly structured by polished tannins. This Reserve Shiraz from Adam is Top Shelf in every sense of the word and made from intensely flavoured grapes hand picked from exceptional sites in the Northern and Southern ends of the Clare Valley. Once you twist the cap, aromas of dark berry, brambly, savoury fruits with notes of fennel, pepper, cloves and cinnamon will float around and make your mouth water. Try not to dive right into the glass at this point! With a palate underpinned by firm, but not overwhelming tannins, and spicy French oak, it's a wine gifted with great length and persistence of flavour. Made in tiny quantities, this is certainly a wine to treat yourself or share with someone special. Adrian and Rebecca's Family Reserve range is their ultimate offering. These premium wines are hand crafted to capture the true essence of the Yarra Valley region. There's nothing old school about this Chardonnay - it is modern and fresh! It's certainly a classy drop for those looking to take their wine journey to the next level. The Santolin Family Reserve Chardonnay was hand picked from low yielding vines, naturally fermented in French oak and matured for a further 9 months. You’ll be awestruck by the hazelnut and grapefruit aromas and flavours all beautifully wrapped up and balanced by a hint of oak and melon. The gorgeous acidity gives this luxe wine an impressively long finish. Best of all, the price is an unbelievable exclusive for Angels who want to treat themselves to premium Yarra Valley quality without forking out on an over inflated price tag.